April 01 - October 31 Every night at 6pm except July 14th and 29th and special events November 01 - March 31 Only friday and sunday, except special events. Spend an unforgettable evening on a dinner cruise with the Compagnie Marina de Paris followed by the Lido de Paris’s new show ‘Paris Merveilles’. Your evening begins in a relaxing atmosphere with a dinner cruise on the Seine with La Marina de Paris. You’ll dine in comfort enjoying gourmet cuisine and wonderful views of Paris’s finest monuments all lit up: the Louvre Museum, Notre-Dame, the Conciergerie, the Eiffel Tower, not forgetting the French capital’s prestigious bridges. See the menu ‘Découverte’ (starter + main course + dessert + drink) of the Marina de Paris. After your cruise, a luxury coach will drive you to the world’s most beautiful avenue – the Champs Elysées. 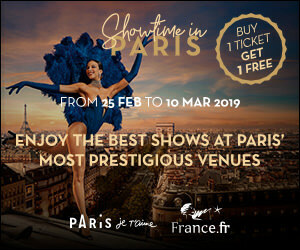 Here at the famous Lido cabaret, you’ll enjoy a glass of champagne and see the Lido’s new revue ‘ Paris Merveilles’, created and staged by Franco Dragone. Admire the legendary Bluebell Girls and their sumptuous costumes, and revisit iconic addresses of the City of Light. At the end of the show, your coach will take you to the area in which your place of residence in Paris is situated. Only friday and sunday, except special events.